Following the sharp decline of the last three weeks in the euro vs dollar it comes as no great surprise to see the pair stage a mini rally or short squeeze in an attempt to recover some of the losses seen in the last 2 months. The reversal began on Monday with a narrow spread up candle followed by a similar pattern on Tuesday and we may well see this repeated in trading today. 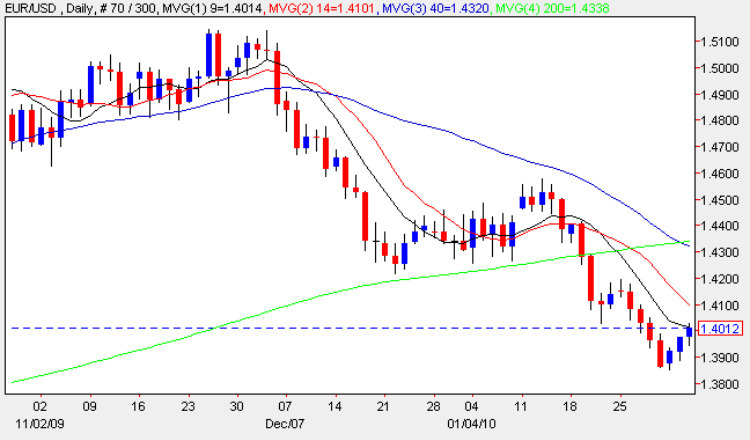 However, with all three moving averages still pointing firmly lower on the euro vs dollar daily chart the first technical level which needs to be breached is the 9 day moving average which currently sits in the USD1.40 price handle and so far, in this morning’s trading, has proved to be a stubborn obstacle. Should this be breached today then in the medium term we have deep and sustained resistance now above, firstly in the USD1.41 area followed by a broader area at the USD1.43 price region. Either of these zones of congestion has the potential to snuff out the current rally. From a fundamental perspective markets are still focused on the Greek debt problems and speculation as to whether Germany will be obliged to bail out the Club med countries (Portugal, Italy, Greece & Spain) and with all the political (and economic) fallout that such a move would provoke. Economic news today centres around the ADP non farm numbers in the US, which as always should provide us with a clue to Friday’s Non Farm Payroll data with the forecast for today suggesting a further fall from -84k down to -31k. Should this forecast be correct then this could provide a boost to the dollar creating a modest pullback in the euro vs dollar later in the currency trading session. The effect of this could be counterbalanced by the ISM non manufacturing PMI data which is forecast to show a modest improvement from 49.8 to 51.1 this time around. In addition we have the crude oil inventories and tomorrow, of course, sees the ECB rate decision.